Her Sound of Music medley at the Oscars highlighted her underlying talent, just at the right time. Going into Oscars night, ABC made sure viewers knew that Lady Gaga would perform; missing from the promotional ads and press material, though, was any mention of what she’d be doing. In the moments before she took the stage, host Neil Patrick Harris promised that what was about to happen would be talked about plenty the next day. And with Gaga's history at awards shows—hatching out of an egg, dying bloodily, getting dirty with Elton John, playing drag king, The Meat Dress—who could doubt him? Gaga’s stunt, it turned out, was to have no stunt at all. After a montage of Sound of Music film clips honoring the 50th anniversary of the movie musical, she appeared on stage in a wedding-appropriate gown and, with great control and stillness, sang "The Hills Are Alive," "My Favorite Things," "Edelweiss" and "Climb Every Mountain." The music was faithful; the décor was understated. Julie Andrews emerged afterwards with sincere-seeming congratulations—“it really warmed my heart, it really did”—and Internet commenters raved. Consequence of Sound called it Gaga’s best performance ever; Twitter was alive with the sound of people saying that they didn’t know she could sing like that. 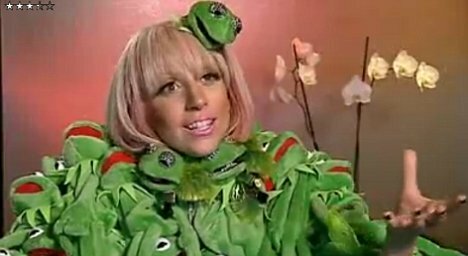 Part of Gaga’s mystique has long been that underneath the Kermit frocks and EDM beats is Stefani Germanotta, a songwriter whose pre-Gaga performances earned her comparisons to Norah Jones. As she rose to fame, Gaga portrayed herself as something other than human—“Mother Monster”—by sporting facial prosthetics on stage, wearing outlandish looks even when running daily errands, and making a point of not mentioning her personal life. Websites would post footage of Germanotta's stripped-down NYU shows as if they were exposés, and at a certain point it became more lucrative to run slideshows of Gaga out of costume rather than in it. In the last few months or so, though, plainclothes Gaga has made her return. Her 2014 album with Tony Bennett, Cheek to Cheek, was a decidedly traditional affair, a collection of standards featuring untreated, jazzy vocals. While promoting it, and performing with Bennett at the Grammys, Gaga has kept her avant-garde costuming to a relative minimum. A week ago, she announced via Instagram that she was engaged to the actor Taylor Kinney. The Oscars, where she sang timeless songs about the timelessness of song, cemented it: The gap between Gaga and Germanotta is small right now. What’s funny is that “be yourself” was Gaga’s motto when she was at the height of her pop opulence, around the time of 2011's Born This Way. Back then, she used bizarre clothes and brash, earnest rock music to dramatize the idea that being true to one’s own desires and identity was a radical act—that people might make fun of you, but that a community of like-minded freaks would always have your back. Her move to classic styles visually and sonically isn't necessarily a rejection of that idea; she feels like singing cabaret, and so sales be damned, she's doing it. Her recent phase also might reflect pop culture’s hangover from peak Gaga and all it entailed. For a few years, it seemed like she, Kesha, Katy Perry, and Nicki Minaj were in a race to out-weirdo one another while slinging self-empowerment messages. Then Miley Cyrus came along with her dancing bears and twerking and cultural appropriation, testing the public’s appetite for pop stars who preached the “do what you want” gospel by being as outrageous as possible. Kesha’s gone mostly quiet, Perry and Minaj leaned hard on the ballads for their most recent albums, and the relative tameness of the current pop moment was made official by all the slow, sad crooning that dominated the 2015 Grammys. In this environment, Gaga—truly talented vocally, with a peppy stage presence and a deep knowledge of musical history—could turn out to be as vital as she’s ever been. And her club-conquering days may not be over: RedOne, the producer who helped create Gaga's influential sound, says he’s working on a dance album with her that's aiming to be one of the greatest of the decade. For now, she's playing smart—still living for the applause, just a little less flashily.